After writing my 39-week update on Friday where I shared that I felt mentally prepared to go up until my due date with Baby Bum, I woke up around 7am on Saturday, June 17, with mild contractions and feeling crampy. Maybe I jinxed myself. R woke up soon after, and I made us breakfast and we had a lazy morning while I continued to have contractions. They weren't necessarily painful, but they were uncomfortable, and I just didn't feel well in general all morning. When Jordan woke up I told him that I wasn't feeling very good and that I was having some mild contractions. 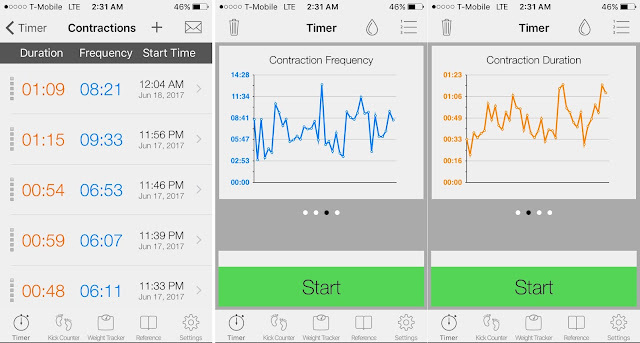 I downloaded a contraction timer app because last time with R I literally wrote down the time of contractions on a piece of paper for thirteen hours, and it was super annoying. I swore that this time I would join the twenty-first century and find an app for that. 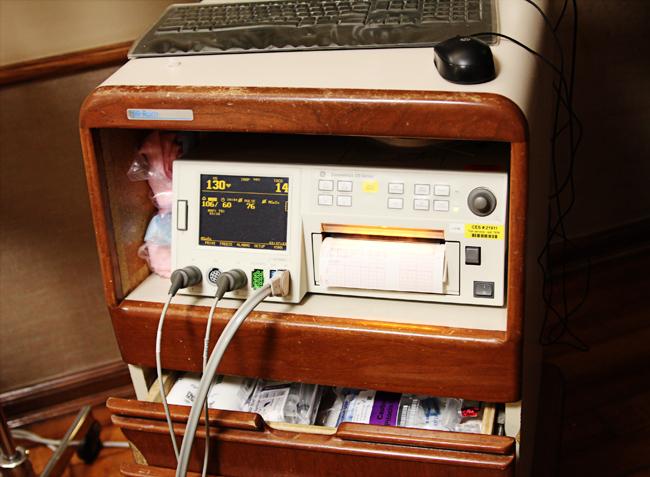 My contractions were very inconsistent and not close together, anywhere from fifteen to twenty minutes apart, and I honestly wasn't sure whether or not I was having real or fake labor. I literally Googled "what is the difference between real and fake labor" and then I got mad at myself because hi, I've done this before. Shouldn't I know what a real contraction feels like? But I think mostly my problem was that I was in denial. After nine months spent anticipating the arrival of J, the idea that I could be meeting him very soon was freaking me out. Plus I wasn't leaking fluid or having any symptoms other than a crampy feeling similar to being on my period, so I thought it was possibly just intense Braxton Hicks. Nevertheless, I thought it might be a good idea to pack a hospital bag. Even if it wasn't the real deal, I was 39 weeks pregnant and would need it at some point. Jordan, meanwhile, was convinced I was in labor and wouldn't stop following me around asking me questions about how I was feeling. I suppose you think that sounds nice, but really it was just extremely annoying. In retrospect, that right there should have been a sign that I was, in fact, in labor because both times I've been in labor, with R and now with J, I am extremely irritable and don't want to be talked to or touched by anyone. Basically what I'm saying is that I'm super fun to be around. I went to the party and then ran a few errands on the way home. One of them was swinging by Target to return a few baby items and buy a wedding gift for friends of ours, which is hilarious to me now because I also went to Target the day I was in labor with R.
From the time I left our house at 11:30 to the time I got home around 2:30, I didn't have any contractions and felt mostly normal, minus a faint feeling of nausea that might have been due to the copious amount of BBQ I consumed at the birthday party. I mentioned in my 39-week update that Jordan was hoping I would go into labor and have the baby on a weekend, so he was sad to learn that my contractions had all but stopped. When I got home, R was just waking up from her nap, so I got her a snack, and I noticed that my contractions had started again. They still weren't very close together, but they were definitely more uncomfortable than the ones from that morning. Jordan took over helping with R while I laid on the couch feeling grouchy and more and more uncomfortable. At one point Jordan's mom came over to see R and say hi, and as soon as I heard Jordan open the door to let her inside, I marched right past her and back to our bedroom without saying anything. I later found out that my MIL called my mom to tell her that she should talk to me about going to the hospital because she was well aware of my irritability from my labor with R.
But I had now been having contractions for seventeen hours (minus the 3 hours in the middle of the day where they had stopped) that were increasingly more and more painful, and I was definitely not going to be able to sleep in the state I was in. At midnight nearly on the dot, I went back to our bedroom (I had started sleeping on the couch because it was more comfortable to me than our bed) and told Jordan we should go to the hospital. He called his parents to come over and stay with R, and I thought they would take a while, but they were at our house within ten minutes. Clearly my MIL had seen this coming. I still wasn't convinced they weren't going to just send us back home, but we put the infant car seat in the backseat and grabbed our bags and headed downtown. Once we got to the hospital, they got me hooked up to a monitor and a nurse came in to check me. It felt like she barely reached her hand down before she immediately said, "Well, you're at 5cm and you have a bulging bag of waters. Let's get you admitted." Jordan immediately texted our parents to tell them this was the real deal. I seriously cannot believe that for both of my babies my parents have made the three-hour drive to Oklahoma in the middle of the night! We were both a little shocked because we had been at the hospital for just about fifteen minutes at this point. With R we stayed in the room being monitored for a good hour and a half at least before they said I should be admitted. I looked at the nurse and said, "You're not serious! We're staying?!" and she chuckled and said, "You seem irritated about that." All I could say was, "I'm just so surprised!" Clearly I was feeling extremely calm about it. They asked me if I wanted an epidural, and I told them I wanted to see how things went but no for now. I got in a wheelchair, and they took me down to L&D to get settled into the room where we would (hopefully) soon be meeting our son! 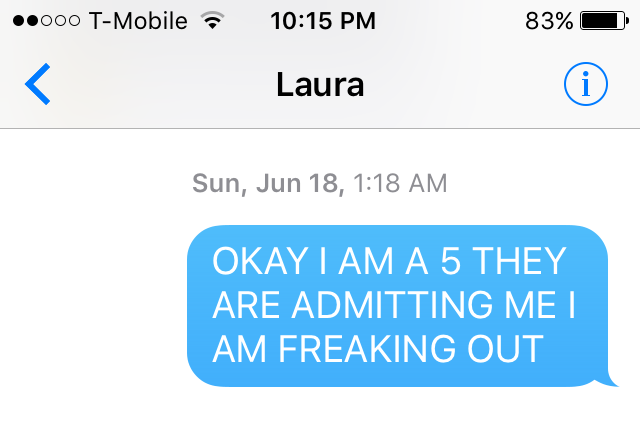 It was 1:15 am on Sunday, June 18. Your irritability during labor cracks me up, I don't know why. This was very entertaining and I can't wait to see what happens next! Obviously I know the end result, but still. You are basically a sitcom character of irritability and I love it. Gah! I need Part 2 now! Lol I know it probably wasn't funny at all at the time, but you're sure turning the irritability into a good story :) Can't wait to hear the rest! 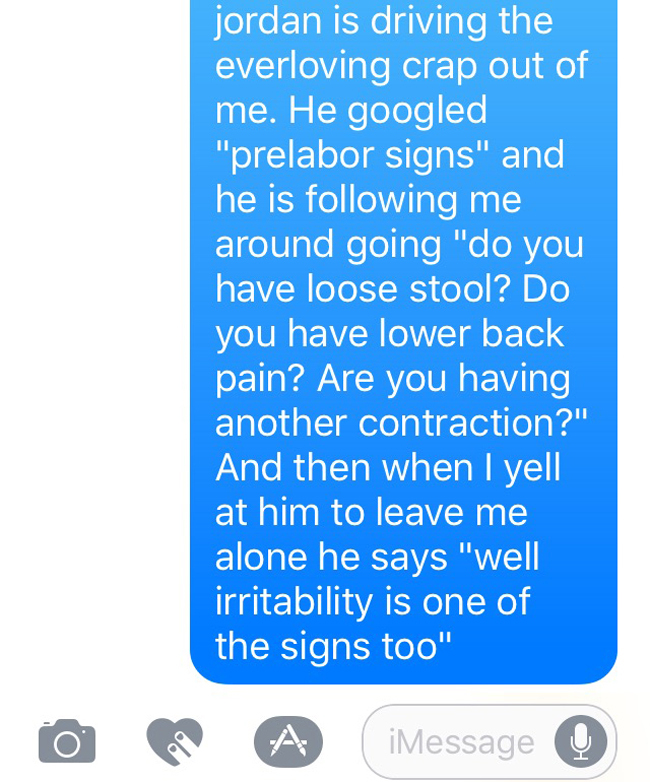 If irritability is a sign of labor, I've been labor since 32 weeks. I love this! So excited to read the rest :) Good job persevering through so many hours of contractions! So glad you enjoyed it! It's funny to me now how cranky I was! Haha! Bahaha I love this. Your crankiness is funny. I was thinking it sounded a lot like real labor, and if I had realized how irritated you were, I would have been even more certain. I'm a new reader but love your posts! I had my first baby last October and I can relate so much to this. 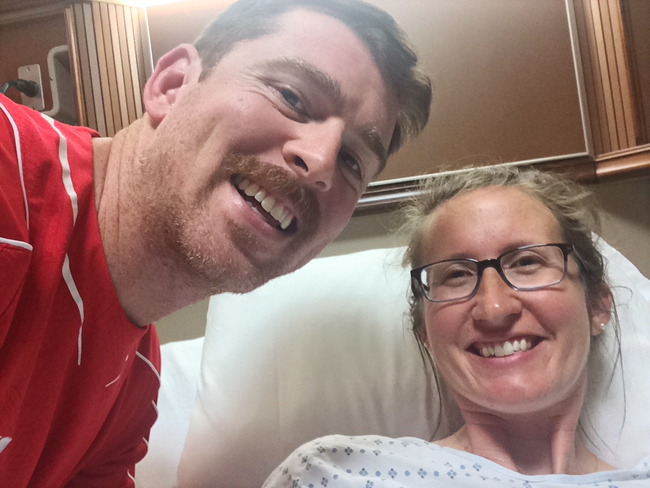 The entire weekend I went into labor, I was having so many irregular contractions and my husband was asking me for updates for what felt like every five minutes. I told him it's clearly just false or fake labor or something so please stop!! My in laws were also visiting our house and I was SO. ANNOYED. With everything. I remember going into our room for like an hour and just hiding from everyone, and asking my husband to send them home (two hours away) even though he was pretty sure the baby was coming. Then, to prove I was actually fine and NOT in labor I made a big batch of peanut butter cookies. Clearly I was totally rational. I went to the hospital later that night. Can't wait to hear the rest of your story!! Oh man I was nervous you were going to go into labor at your friend's party! So funny that everyone could tell by your mood but you!! :) Can't wait for part 2! Love love love this! I'm so amused that everyone KNEW you were in labor but you. Hahahaha! That's adorable!! Can't wait for part 2! I have been late with a few babies and tried EVERYTHING to get labor started. I did not, however, go to Target and now I think I know where I went wrong. CLIFF HANGER!!! I want to know what happens next!! You're such an awesome writer!!! Ahh, I loved this story and I can't wait for part 2. Isn't it funny how other people know us better than we know ourselves sometimes? Also, your texts really make this post. You really do capture the story so well--thank you for making such an intimate part of life so fun and humorous!I hope you and the baby are doing amazingly! Noooo I want to keep reading!!! I'm so far behind! Cracking up about your irritability, so funny! See, this one didn't scare me but I'm sure part 2 will =). Who isn't cranky when they are in labor? I mean isn't that natural to be grouchy when your body is trying to work a baby out??? If Dave and I are in a really big argument he will follow me around and I get so so so mad! That's a rare occasion but it has happened. So, I can't imagine that being pregnant. I love birth stories!!! It's so funny that you're irritable when in labor. Both times my water broke before contractions began and, reading this, I'm really glad that I never had to guess if I was in labor! I guess you waited nine months so I can wait a couple days to read the rest. But I'm ready. Just so you know. I think that is so funny that you went to a birthday party and ran errands while you were in labor! I went immediately to the hospital. And I was irritable too. Jerry was trying to be funny in the car and I was SO MAD at him. LOL. oh my gosh laughing so hard at jordan following you around and asking questions. i can definitely see myself being irritable when it's my time lol. selfishly glad i am behind on blog reading because now i can go straight to part 2! Oh my gosh, I love your stories. Those text message screen shots had me dying laughing! So funny that you were in such denial. But really, at least you were home and doing things you wanted to be doing rather than sitting in a hospital having contractions... that's the way I see it at least!